So many times when a woman loses a child during pregnancy she also loses her hopes and her dreams. The families affected by pregnancy loss often feel isolated in their grief and lacking support. 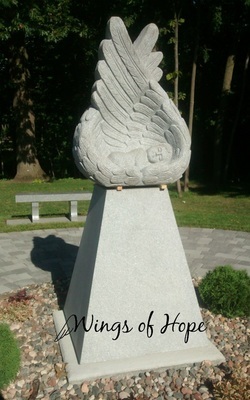 The Wings of Hope memorial offers the community of Southern MN a resource for these mothers and families. It reminds us that hope is the gift to which we cling in our saddest times. It allows us to grieve for our lost dreams while being surrounded by the support of the community. Located along St. Jerome Drive in Calvary Cemetery and set against a peaceful wooded backdrop, this space within the cemetery offers families and the community a place to go for reflection, prayer, and remembrance of children lost during pregnancy. Providing a final resting place for children lost in miscarriage was a major topic at the August 14 meeting of the Calvary Cemetery Association meeting. Calvary Caretaker Terry Miller has been working closely with a group called “Project Embrace” to create an area at Calvary Cemetery dedicated for children who die before birth. This special area will be known as the “Wings of Hope” section. This special area is planned to feature a paving stone walkway and a special central monument created by Tom Miller. Terry reported to the association that Mankato area coroners have agreed to work together to preserve the remains of miscarried infants until burial at Calvary. Such burials would take place periodically throughout the year.